I’m going to shout this in case you can’t hear me: DATING TAKES WORK. We all remember a story of the one couple we know who met on the airplane. That’s lovely, but it’s also an outlier. Or how about those people who happened to be at the same birthday party and can’t believe they’ve never met before? That’s lovely, too. But we can’t rely on serendipity. We can count on hard work… and even then, there’s no guarantee. For some clients’ coaching sessions, what I do is have them come to my office—in person or virtually—with their dating app-equipped phone in hand. I first look at their activity, or lack thereof, on whichever app(s) or sites they are using. 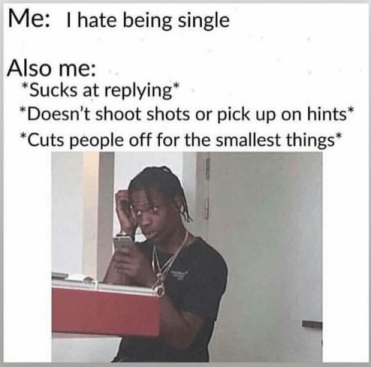 After I have momentary heart failure when I see how many new matches are listed (as in, you’ve both “swiped right” on each other, indicating that you like each other) with not a single conversation happening, we go through the app slowly but surely until it’s organized and efficient. First, we clean out those matches. We look at the profile and decide whether to send a message or not. For the ones who don’t interest my client, we “unmatch” them (meaning, they are no longer listed as matches in the app), and for the ones who do, we send a short, often cheeky, message to catch that person’s attention. Once this is done, we swipe a bit. I like the rule of thumb “50 swipes or 5 matches—whichever comes first.” (On the larger sites like Match.com, try to send at least 10 emails a week.) Once we get any new matches, we write to them immediately. Usually, by the end of the hour with a client, he or she will have a date lined up for that week. A little bit of work, either with my hand forcing it or not, to get a date or two lined up seems worth it to me. But people aren’t doing that. I was once on a vacation with a friend of mine. She’s accomplished and beautiful. She often shares with me her frustrations with being single and dating. I love my friend dearly, but it gets grating, especially when she’s complaining to a dating coach! Anyway, on this trip, I saw her swiping through Bumble numerous times. More than numerous, actually. Sometimes she would show me a profile that was particularly egregious. But for all that swiping, I never saw her send a message to anyone. Not one. (Don’t worry—she knows how I feel about this, so I’m not “outing” her.) Unfortunately, this is how too many people do online dating… by not doing it. Whether it’s laziness, cluelessness, or a defense mechanism to then say, “I tried and it didn’t work,” I’ll never know. I encourage you to do anything you want—dating or otherwise—in a strategic manner. If, for example, you need to find a new job, you take the time to put together your resume, maybe do some practice interviews, buy some new clothes, and send your resume out to as many appropriate positions as possible. People don’t browse job postings simply to see what’s out there, never send a resume, and then get upset that they haven’t gotten a job. So much comes down to people realizing that anything in life that’s worth it takes effort, time, and hard work. As a coach, I get frustrated—perhaps more than my clients and friends who express their frustrations with being single to me—when someone has these amazing tools at his or her disposal and isn’t using them efficiently because “it’s hard” or “it should just happen.” If I waited for things to “just happen,” I’d be sitting in a cubicle at Fannie Mae right now, watching my life pass me by (oh wait, no windows). If I waited for things to “just happen,” I wouldn’t have had all of the wonderful dates and relationships I’ve had from various online dating sites. And, if I waited for things to “just happen,” I wouldn’t be writing this article right now. ← Can We Apply the KonMarie Method to Relationships?